During the month of October, many hours of planning, building sets, and thinking outside the box makes for no regular day at the office. As our middle name suggests, Lifestyles is all about creating lasting memories as we offer the best events for our residents. October 29th’s event was no exception. Bellalago transformed into “HellaLago,” which is our annual Halloween event that has grown each year. We welcomed over 1,200 men, women and children to this year’s scary spooktacular. 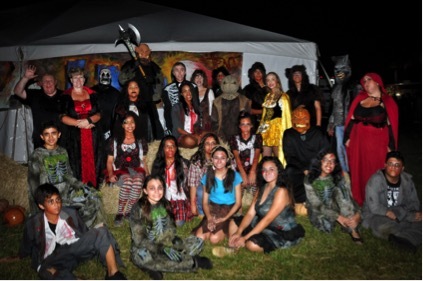 The staff and community teen volunteers entertain and scare our residents and they keep coming back for more! This year we went all out to make this event bigger and better than ever before. The 100 ft “Tent of Terror” was transformed into your worst nightmare! This year our theme was nursery rhymes and fairytales. Goldilocks, Red Riding Hood, and Jack and the Beanstalk, along with witches, ghosts and zombies, all came out to delight in this one-of-a-kind night. We also had some great entertainment from “Loud Live.” This street-inspired group did not disappoint Bellalago residents. They kept the area pumping and put on an amazing show. Round this off with a bounce house, rock wall, trampolines, cotton candy, crafts, and oh so much candy, Bellalago has become the place to be on Halloween. At Evergreen Lifestyles Management, we prides ourselves on being the best in the industry. We have some of the most creative staff that is able to turn any regular day into something special. We are fortunate to be able to work in some of the best communities in Central Florida, and love to foster a sense of community among our residents. They are already looking forward to next year’s event!